Another new brewery added to our territory, Foreign Objects Brewing. We brought in Death Posture - what they call a “New-American Hoppy Ale” - sure to satisfy those hop-seekers & IPA fans out there. Assume the Death Posture and glean beyond this subjective experience of reality! Attain the Chaote’s gnosis - the Void-Self Perception! 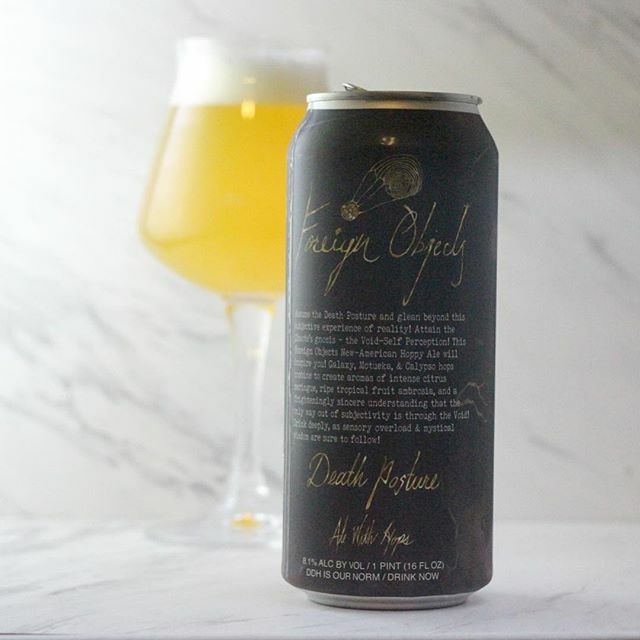 This Foreign Objects New-American Hoppy Ale will inspire you! Galaxy, Motueka, & Calypso hops combine to create aromas of intense citrus meringue, ripe tropical fruit ambrosia, and a frighteningly sincere understanding that the only way out of subjectivity is through the Void! Drink deeply, as sensory overload & mystical wisdom are sure to follow!